We all started our journey from Kishkinda, Hampi towards Lakshman Theertha located in Nagarhole forest. Sri Rama Anu Yatra was organised twice, in the year 2006 and 2010. In 2006, most of the places were covered with the help of train. In 2010, all the places were covered in the same bus from start to end. In 2006 to reach Mysore, we had to travel to Hubli and from there we took train to Mysore. During this course of journey in 2006, we had an opportunity to visit Veeranarayana Temple located in Gadag. 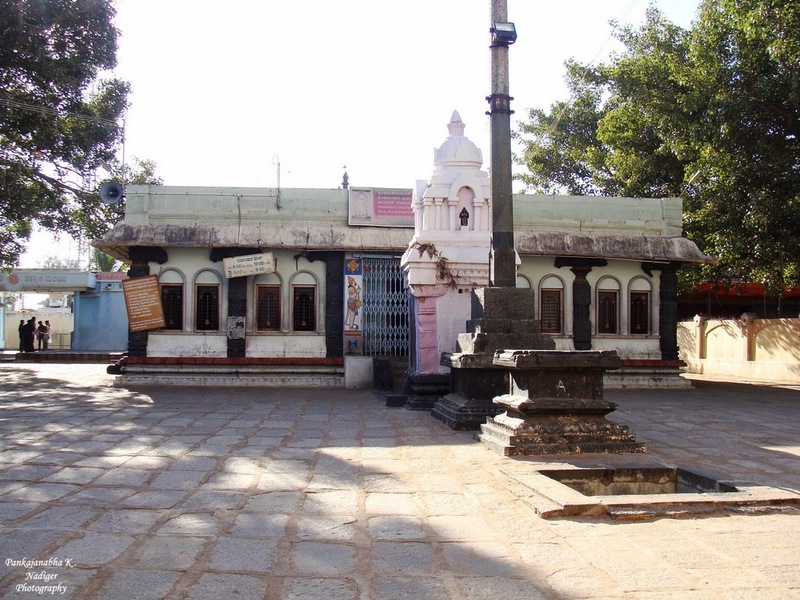 The Veeranarayana Temple is located in Gadag town, Gadag district of Karnataka. 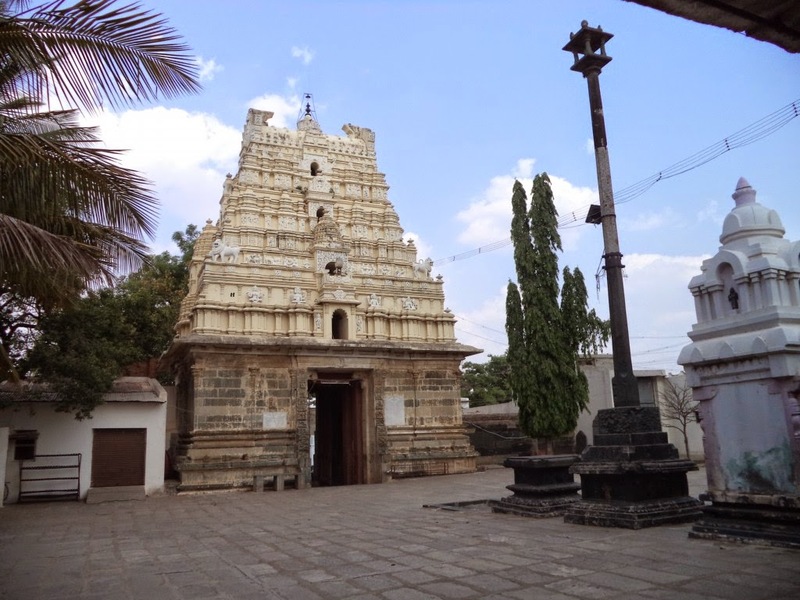 The Veeranarayana Temple is another of the ancient monuments that make Gadag such an important tourist and pilgrim spot. This temple is dedicated to Maha Vishnu or Narayana. The main deity is called Veeranarayana, Sri Maha Vishnu in his warrior form. This temple reflects the styles of many different schools of architecture. The Hoysala King Bittideva was influenced by the great Vaishnava Saint Sri Ramanujacharya and converted to Vaishnavism from Jainism. He changed his name to Vishnuvardhana. He built several temples and this Veeranarayana temple is believed to be one among them. It is one of the Pancha Narayana Kshetras. The Kannada Poet Kumara Vyasa is believed to have composed his version of the Mahabharata in this temple. Swamy Ramanujar established Vishistidadvaitam with Srirangam as his base and was becoming very popular. The chola king named Krimikanta cholan who was a staunch Saivite was inflicting harm on Srivaishnavas and did not even spare Ramanujar from prosecution. When his soldiers arrived, Kooratazhwan disguised as Ramanujar along with Peria Nambigal attended the king’s summons thus saving Swamy Ramanujar from the king’s cruelties. It was Namperumal’s thiruvullam to make Ramanujar leave Srirangam and purify other places by placing his holy feet in Melnadu and retrieve Thirunarayanan who was worshipped by SriRamar and Sri Krishnar. Peria Perumal thus created a difficult situation by which Swamy Ramanujar had to leave Srirangam after taking Peria Perumal’s consent and proceeded towards north accompanied by Sri Mudaliandan Swamy. After many days of travel and undergoing various hardships following the course of Kaveri, Swamy finally arrived in Karnataka where the local tribals served them. This place is near Srirangapatinam. The local people who were averse to Swamy Ramanujar conspired a plan to do away with him. Swamy Ramanujar learning their evil intentions ordered Mudaliandan Swamy to place his feet in the drinking water pond in that area which he obeyed. By drinking this Sripada theertham, the minds of the evildoers changed and they fell at Swamy Ramanujar seeking forgiveness. Such was the greatness of our Mudaliandan Swmay. Ramanujar named this place as “Saligramam” which is near Melkote. Even today this pond is maintained by the archakar who ensures that no intruder pollutes the pond by locking the gate. There is a small temple opposite to this pond in which Swamy Ramanujar’s Thiruvadi chuvadugal are worshipped. There is also a vigraham of Swamy Ramanujar in Sesharoopam near the garbagriham. At that time, Jainism was prominent in Melnadu which was ruled by King Bittideva who was a staunch follower of Jainism. The king’s daughter was possessed by an evil spirit and no one could cure her. Vaduga Nambi, a disciple of Swamy Ramanujar suggested to the queen that his spiritual master was capable of restoring the princess to normalcy. The Jain king invited Ramanujar to his palace to cure the princess but Swamy was initially reluctant to enter a palace. Vaduga nambi persuaded Swamy Ramanujar to resent to the king’s plea which could help in establishing faith in Srivaishanvism. Swamy Ramanujar consented and sanctified the place, he drove away the evil spirit by placing a dhastamam (stick) on her head uttering some mantra and splashed some water and immediately the princess became normal. (This stick is at Yoga Narasimhar sannidhi in Thondanur. The archakar places the dhastamam on the visitors head and sprinkles water on the face.) King Bittideva, true to his word, became Swamy Ramanujar’s disciple and embraced Srivaishnavism and was named "Vishnu Vardhana" and thus the entire kingdom became Ramanujar’s followers. It is told that about 1000 Jain pandits who could not bear this challenged Ramanujar for an argument. To defeat them, Ramanujar advised a curtain to be drawn in between and taking his original form of Adisesha with 1000 hoods, he answered and defeated all the 1000 Jains at a time. This incident happened at Narasimhar sannidhi in Bhakta nagari (presently known as Thondanur). Sri Mudaliandan Swamy rendered “Dhaati Panchakam”in praise of Ramanujar at this place. 01. Sri Vijaya Narayana Temple, Gundulpet. 02. Sri Keerthi Narayana Temple, Talakad. 03. Sri Sowmya Kesava Narayana Temple, Belur. 04. Sri Nambi Narayana Temple, Thondanur. 05. Sri Veera Narayana Temple, Gadag. Gadag known as Kruthapuram is one of the pancha Narayana kshetram. The presiding Perumal is Sri Veera Narayananabout 5 feet clad in yellow pithambaram holding chakram on the upper hastam and sankhu on the lower side. The lower right hastam is in abhaya mudra and the Lord holds blossomed Padmam in lower left hastam (like Guruvayurappan). A gadam is placed on the right side. Ubhaya nachiyars-Sridevi and Bhudevi about 1.5 ft are on either sides. The utsava murthi is Krishnar. As the moolavar is Saligrama thirumeni, every day thirumanjanam is performed to Perumal. Belief is that one will attain Vaikunta Moksham if he visited the Pancha Narayana Kshetram. Following Lord Rama's footsteps, we are at Mysore as part of the Sri Rama Anu Yatra. Why have we come here? Did Lord Rama had come here? Yes. Hanuman came back from Lanka after succeeding in searching Sita. Hanuman explained everything to Lord Rama who was at Kishkinda. Then Sugrivan decided to travel south with all his troops. This Lakshmana theertham is on the way which was chosen and travelled by the monkey troops. One can reach Lakshmana theertham by bus from Mysore too. Rama has a close connection with Mysore. Near Mysore is Melkote, Thirunarayanapuram. Thirunarayanapuram is called as Jnana Mandapam. 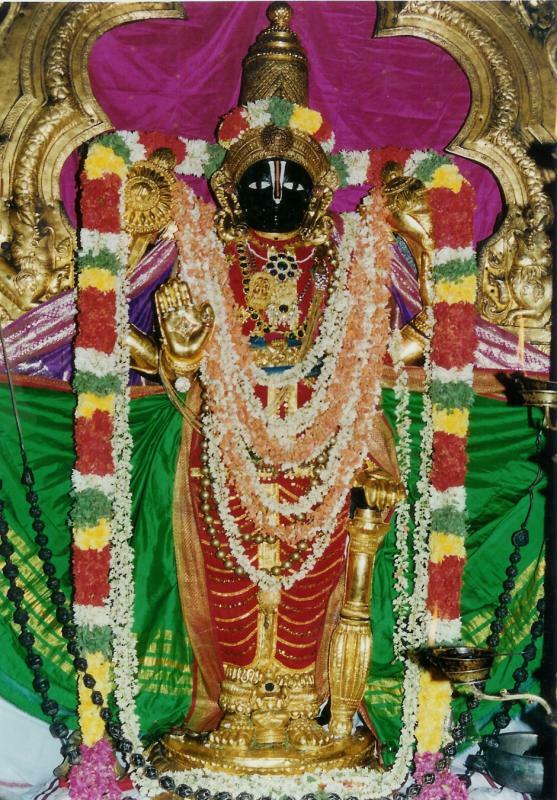 Srirangam, Thirumalai Tirupti, Kanchipuram, Thirunarayanapuram - are the 4 Vaishnava Thiruthalam. The utsava murthy of Thirunarayanapuram is called as Ramapriyan. Let us see the story and how this place is related to Ram in short. After Lord Rama had given his pooja idol, Ranganatha, to the newly crowned Lankan King Vibheeshana, he was left without a deity for his daily poojas. Brahma is said to have given Selvanarayana to Rama. Later, Rama passed this on to his sons Lava and Kusha. When Kusha’s daughter got married to a Yadava prince, this deity was given as part of the gifts and thus this idol landed up in the lunar dynasty from the solar dynasty. Driven out of Srirangam by the Chozhas, Ramanuja came to a place called Thondanur (Bhaktha Puri) near ThiruNarayanapuram. The daughter of the Jain King Bitta Deva, who was ruling the region had developed a disease. Using his powers, Ramanuja cured the king’s daughter. Later, Ramanuja found himself short of Thiruman. That day Lord Narayanan appeared in his dreams and informed him that he was residing in a pit in a hill nearby and that the Thiruman he is looking for can also be found there. With the help of Bitta Deva, Ramanuja came to Thiru Narayanapuram and located the moolavar lord and performed consecration of the temple. Ramanuja, while he was happy that the moolavar deity of Thiru Narayanan was founded, Emberumaanar was keen to have regular festivals at this temple round the year. However, he found he could not do this as there was no Utsava deity (the processional idol). Once again, the Lord came in his dreams and said that his utsava deity was now under the custody of a sultan king. Immediately, Ramanuja approached the Sultan king briefing him of the situation at the temple. The king asked Ramanuja to identify his idol amongst the many that the king had taken custody of. Unable to find his Lord, Ramanuja spent the night there. The next morning he called out ‘Adiyen Vareeren Enthan Selva Pillai’ and like a small child, the lord ran up to Ramanuja, from the chamber of the princess, and sat on his lap. Delighted at finding the processional deity, Ramanuja brought the Lord back to Thiru Narayanapuram. With the Lord having reacted to Ramanuja’s call of ‘Selva Pillai’, the name stuck and from that day, Rama Priyan came to be called 'Selva Pillai'. Unhappy at the departure of her favourite Lord, the princess followed suit and joined Selva Pillai at Melkote and she is said to have remained there ever after serving at the feet of the Lord. Having found the Utsava deity, Ramanuja stayed here for 12 years and set up processes for daily poojas, rituals and annual festivals. One day, when he was performing his pooja at Kalyani pushkarani, he heard the news of the death of the Chozha king and decided that it was time for him to head back to Srirangam. He brought 52 Bhattars (Aivattiruvar) from Srirangam to perform the daily poojas at this temple. Unhappy on hearing the news of his proposed departure from Melkote, the people for whom he was so dear, wanted him to stay back. As an alternate, Ramanuja created a Pancha Logam image of his and left this behind with a request asking them to always take care of his beloved 'Selva Pillai'. Ramanuja is seen here with an ‘Ugantha Thirumeni’. Over the last 1000 years, Vijayanagara kings, the Hoysalas and more recently the Wodeyar dynasty have made significant contributions to this temple. The Melkote Temple was not covered as part of Sri Rama Anu Yatra. Just the information related to it was shared in Sri Ramanin Padhayil. Now let us travel to Lakshman Theertam located in Nagarhole National Park.